ActivArmor provides many benefits to geriatric patients requiring orthopedic support, including those with thinning skin, diabetes and mobility challenges. Elderly patients face many medical challenges, including orthoses for protection, support and stability. But traditional orthoses can rub and cause skin irritation and interfere with normal daily activities like washing, gardening and doing the dishes. In addition, patients may have mobility challenges, such as getting into the bath or shower, and trying to keep your cast or splint dry can cause instability, and even result in a fall. 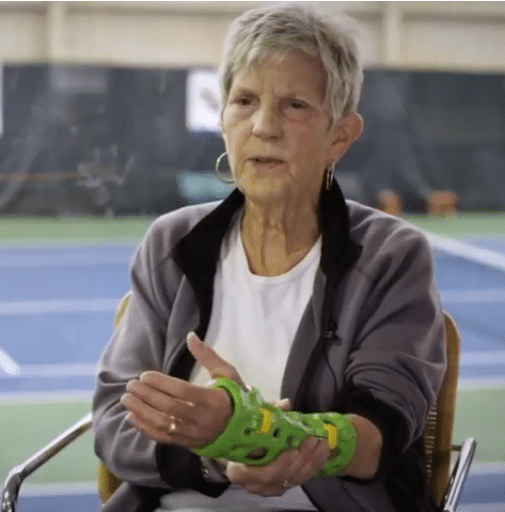 ActivArmor support devices are breathable, hygienic and waterproof, which allow geriatric patients to continue their daily activities, without cumbersome, smelly splints, unhygienic padding, or flimsy velcro. Unlike traditional low-temperature thermoplastic splints that are cut from sheets, heated, and squeezed (sometimes painfully) to the patient’s limb, ActivArmor is painlessly fit precisely to the millimeter of the patient’s body map, reducing or eliminating the need for unhygienic, moisture and bacteria-trapping padding materials. Bony protrusions, wounds, or diabetic skin ulcers can be exposed for comfort, observation and/or treatment. The skin can be washed and breathe, which improves hygiene and reduces smell, skin breakdown, itch, and other unpleasant side effects. With the ability to perform regular day-to-day activities in ActivArmor, patients tend to be more compliant when doctors prescribe orthoses for long-term use. And better compliance with doctor’s orders often results in reduced pain and improved healing outcomes for patients. ActivArmor is also adaptable for use with alternative pain treatments such as TENS units, which can reduce a patient’s reliance on pain medication and manage symptoms of chronic conditions such as arthritis and tendonitis. It is also easily adaptable with biomonitors and other sensors to alert falls and monitor health statistics. ActivArmor is available at any of the clinics listed on our website. Simply bring a prescription for a custom splint from your doctor and make an appointment at one of our providing clinics. « ActivArmor Gets Workman’s Comp Patients Back to Work!